It's more than just a link between two worlds. 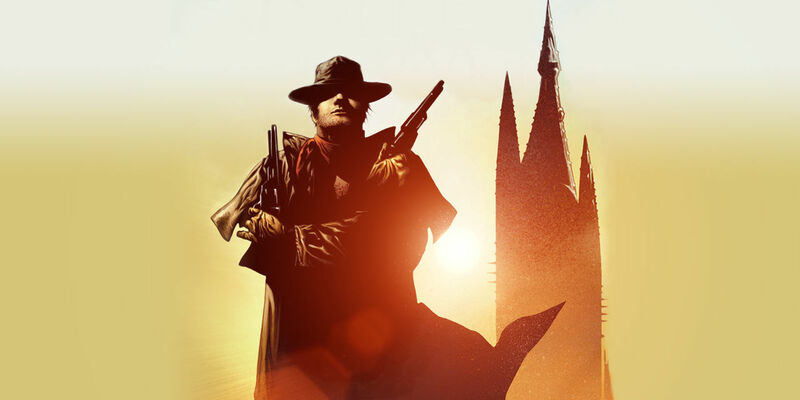 The mythos behind Stephen King’s Dark Tower series grew at a seemingly exponential rate as the eight-book series progressed over the course of almost 20 years. What began as a seemingly simple mystery of a gunslinger on an enigmatic journey — the first book tells us little about Roland’s age, background, or the nature of his quest — eventually explodes into the cosmic scope about a multiverse and an ageless, cyclical quest to reach the Tower — which is what, exactly? Spoilers about The Dark Tower, the nature of existence, and the nexus of all realities are ahead. That hell is visualized by a growing dark cloud overtaking Manhattan and some sort of deep magenta portal opening in a forest along with large, demonic dogs coming out of it. The Tower “exists” in Mid-World, the realm that Roland comes from, but it’s intrinsically connected to Earth (called the Keystone World in the books). As such, the base quest of the Gunslinger in both the books and the movie is the same: Pursue the Man in Black and protect the Tower from being destroyed. Does Roland Know All This in the Book(s)? Though the Gunslinger’s quest remains mostly the same in the book and movie, everything is different in the movie. At the beginning of Roland’s journey in The Gunslinger book, he understands very little about the nature of the Tower or his quest, and he only discovers it all over time. By the time Idris Elba’s Roland encounters Jake in the movie, he knows a lot about how the Tower functions, including the very big spoiler that it protects all worlds. In reality, the nature of the Tower is much more complicated than that, as are Roland’s actual goals. All of space and time converge at one single point, and it’s at the Tower. Should it be destroyed, then so would the infinite number of universes that are connected to it. The Tower has been described as a cosmological lynchpin, or axis mundi by some, but it’s more or less the physical point at which all existence originates from across an infinite number of universes. As such, Roland believes that some sort of God resides at the top of the Tower. So How Does the Tower Work? During the trailer, we can glimpse what’s eventually described in the series as the six beams — the physical forces that hold up the Tower — which include 12 spokes. At the end of each beam is a portal to another world, but also an animal guardian protecting the portal and the Tower itself. The Tower has "beams" of light arranged in that pattern for a reason in 'The Dark Tower' movie. The more specific goal of the Man in Black, and all his associates, is to destroy each individual beam so as to bring the Tower down and erase all existence. But the Man in Black is just a henchman of the Crimson King, the godlike being who wishes to remake the universe to his own liking in the wake of such an apocalypse. It’s doubtful that the movie will include the Crimson King, a bear cyborg, or any of the many other totem animal guardians (including the godlike turtle Maturin in the It novel). What Happens If Roland Actually Reaches the Tower? In the books, protecting the Tower is something of a tertiary goal for Roland. Instead, he wishes to climb to the top of the Tower and commune with whatever entity resides there. If the Tower falls, he can’t exactly do that. At the very end of the book series, again, spoiler warning, after sacrificing every companion along the way, Roland breaches the top-most door of the Tower, expecting a confrontation with God. Instead, he is pushed through the doorway by forces he cannot fight, and he finds himself right back at the very start of his journey with his memory fading. The endless repetition of Roland’s hell is perhaps punishment for sacrificing his many companions for the sake of his journey to the Tower. But, the many details included so far in The Dark Tower movie point towards the film not being an adaptation of the book series so much as it is a continuation of it. In the final pages of the last book, it’s revealed that with the Horn of Eld in tow, Roland might be able to conclude his endlessly repetitive journey. In an image teased by Stephen King in May 2016 (featured above), it’s implied that Idris Elba’s Roland will have the Horn of Eld in The Dark Tower. And, if this incarnation of Roland has learned his lesson, maybe compassion towards young Jake and trying to be a savior first and journeyman second might actually allow him to complete his journey, if he can find a way to defeat Matthew McConaughey’s Man in Black. The Dark Tower will be released in theaters August 3. See also: A Beginner’s Guide to Stephen King: Where Should You Start?